How much is a billion dollars with regard to Jeff Bezos? That is about AUD $189 billion. That gives him a budget of AUD $6.3 billion per year. Still hard to conceptualise, hey? On a daily basis, he could spend AUD $17.26 million PER DAY, EVERY DAY FOR THE REST OF HIS LIFE! Is that still hard to fathom? It breaks down to AUD $719,178 per hour (every one of the 24 hours in a day – even while sleeping). Being more detailed, let’s say he sleeps 6 hours a night on average. That’s $958,888/hour of spending – basically a million bucks an hour – EVERY waking hour of EVERY day. If he had a cold for three days and couldn’t get out of bed, he would be about $51 million behind in his spending. So if he has to decide on buying something and it takes 5 minutes to make that decision, that work out at about $60,000 of value (if his spending is linear). It wouldn’t be worth renting a car. He could just buy a car and give it away every time he wants to go somewhere. He’d never need to get it serviced. If there’s a particular coffee shop that he likes to go to, he could easily just buy the place and keep it for his own exclusive use rather than waiting in line for a coffee each day. I wonder if he buys items that he wants off Amazon? Imagine going for a little million dollar splurge on Amazon one night when you’re tired. “A new 747-8 passenger jet now lists for USD $367.8 million”. It would take a whole month of spending money for him to buy a new 747! If he wanted to buy some more RAM for his PC, it wouldn’t be worth the time unless you were installing maybe 10TB of RAM? If he wanted to buy an entire newspaper… well he did – the Washington Post. If you invited him to your birthday party, he might give you a gift. If you compare his wealth relative to ours he could probably pay off every guest’s mortgage for the equivalent of what we might give as a nice birthday gift. Maybe a more upmarket car might suit? The world’s most expensive new car, Koenigsegg CCXR Trevita ($4.8M), would take about 7 hours of daily spending money so he could get a pair of them easily in a day. Imagine if he had all that money invested in a bank account at 2%. That would generate $10 million PER DAY in interest! So not only would he have the problem of trying to spend $17 million per day, his wealth would be increasing another $10m every day. He’d effectively need to be spending about $27m per day but that would eat into his principal eventually. Out of the Top 100 countries by total wealth, he could buy any of 35 of them, but less than 2% of Australia. He could stay in the most expensive hotel in the world (in Geneva, Switzerland) for $80,000/night for less than 1% of his daily spending amount. He could pay for the Banksy shredded piece of art with 2 hours of spending money. I’m bored now, but hopefully this illustrates how much a billion dollars is worth. Of course his wealth isn’t all cash in the bank, nor can it quickly be converted into cash without freaking out other shareholders. BTW, Mr Bezos, if you ever read this, you're welcome to come to my birthday party. Microsoft Windows still does not tell you if a disk you connect is formatted for Mac. The friendly OSX on the Mac will tell you if you plug Microsoft formatted disks into a Mac. This is a trivially simple fix to implement if Microsoft wanted to help users but they're still pretending that other operating systems don't exist. I recently bought a new computer with Windows 8.1 and dumped my trusty old WinXP computer (that ran well for the last 7 years). Overall I am happy with Win 8.1 - even the Metro interface is good. The Metro interface uses the entire screen for selecting the app that you're after instead of the old way starting at the base of a tree (the Start button) and then awkwardly climbing along all the branches of a tree to hunt and get to what you need, hoping you don't fall along the way. 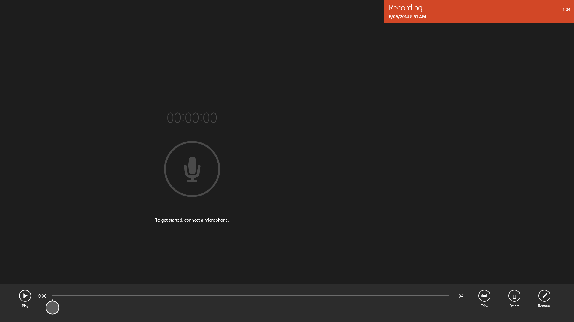 HOWEVER, Microsoft what were you thinking with the Sound Recorder app? There is no ability to Save your recording! Ever since Win3.1 I could SAVE an audio file that I recorded... but not in Win8.1! Microsoft did you get lazy or forget to include a Save function? Were you rushing Win8.1 out the door and didn't have time to add the Save feature? Were you trying to be trendy and copy Apple's GUI restricting the user from finding where their files are stored (ala iPhoto and iTunes)? Microsoft, I'm disappointed in you today. I needed to record an audio file quickly to send to a radio station, I trusted you, I recorded my short speech using your Sound Recorder and I needed to send it to someone within 10 minutes...but I couldn't save my file! January 2007 – Steve Jobs demonstrates Visual Voicemail on the iPhone. 11 July 2008 - iPhone 3G released in Australia. 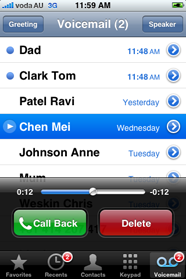 22 March 2011 – Telstra partially activates Visual Voicemail and charges a premium. 22 July 2011 – I switch from Vodafone to Telstra, but no Visual Voicemail. I am so happy to be with Telstra. I’ve been with Vodafone for over 15 years but since the company had an implosion, I’ve been glad to escape from them. Now happily on the Telstra network I can: Make phone calls; Receive phone calls, Use data successfully. The Telstra network works infinitely better than Vodafone’s network, no matter how much advertising Vodafone undertakes to tell me they are fixing their network. The one problem I have with Telstra however is their attitude to iPhone Visual Voicemail. Today I have visited the premier Telstra store in the Sydney CBD where the two Telstra employees initially pretended that they don’t know what Visual Voicemail is. The best they were able to help me was to give me a free-call number to Telstra support. Calling this number led to a ten minute wait while the Telstra employee unsuccessfully tried to activate Visual Voicemail after initially pretending that it didn’t exist. Do you long for the old days of magnetic tape recording? For all over 20 years I longed to move from tape based recording to mature digital recording. * tape hiss and other problems. This crazy new "tape-delay" guitar pedal simulates all of these problems digitally (in stereo) with high precision! Three years ago I purchased two pairs of powered monitor speakers for two music studios. I made several visits to the audio store and auditioned many speakers with my favourite CD recordings. The deliberations tore me apart. I had tasted paradise but one pair cost far more than half the budget amount. I couldn't buy the sweetness for both studios. Now I'm not the sort of guy that would say "don't waste your money on a new set of speakers" and I was smitten. The longest lasting digital media technology? I don't know if you've thought about it much but digital data storage formats change ALL the time and have relatively short lifespans and they fade away before we've copied all of our digital data to the next format. You'd be very hard-pressed to find anyone who could read computer disks prior to the Commodore64 and Apple ][ computers. You'd have a hard time even reading a disk from one of those "old" computers from the 1990's. I don't know of anyone anywhere who has an operating one. I was looking at a cool website called www.longbets.org in which people make predictions for the future (around 10-100 years). I had an idea for a "longbet" - my own prediction on the future but when I went to enter it, they asked for a $50 publishing fee. I found it a lower cost to publish in my own blog instead. So here is my prediction: What is your prediction? In 30 years, some humans will have an additional heart installed as insurance for a heart attack or pulmonary failure. During cardiac arrest, the second heart will keep them alive until medical intervention repairs or transplants the primary heart. Why? Provide an argument in favor of your prediction: RAID5 hard disk systems have provided a popular layer of reliability for mechanical hard disks which always fail eventually. Why not do this for biological reliability? (Of course this will create huge ethical issues because there won't be enough spare hearts for everyone to have one... but that's a separate issue.) What do you think?